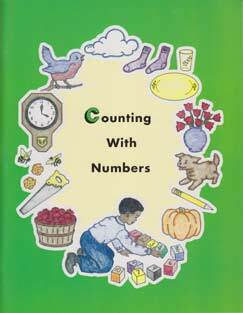 Counting with Numbers teaches the child to identify, write, and know the meanings of the numbers 1-10. It teaches number sequence and simple math-related words, such as more, less, empty, full, first, and last. Size 8 1/4" x 10 1/2" workbook; 64 pages. Instructions for using this book are on pages 63-64. Directions and things to discuss are at the bottom of each page. Click on a book to see sample pages. This site is operated by Milestone Books. We are an independent vendor of materials by Rod and Staff Publishers of Crockett, KY. The samples on this site are taken from copyrighted materials, and are shown for information purposes only.